Sign-up to become a member of the QDNA®, Quantum DNA Acceleration® online community and receive our monthly newsletter, filled with tips, resources, special program announcements, product offers and special member invitations. Subscribe Now! Realizing your dreams takes vision, action, commitment, and a plan with a path to the finish line. Whether you’re setting goals to start a new business or simply to motivate your professional team, success depends on developing a strategic plan that supercharges your goals and gets them from mere objectives to Mission Accomplished. From small entrepreneurs, women in business, to top level CEOs, goal setting is a tool used by most top achievers in every field, however many of us find goal setting challenging. Now that’s about to change, thanks to new cutting edge techniques in Neuroplasticity, a revolutionary brain-science that teaches us how to harness the power of the brain to activate our Emotional Intelligence to achieve our goals. Most of us are aware of SMART goals, an acronym for the five steps of Specific, Measurable, Achievable, Relevant, and Time-based goals. It’s a simple tool used by businesses to go beyond the realm of fuzzy goal-setting into actionable plans for results—but it’s also very “left-brain” in its approach. To fast-track our goals we need the "right-brain" put into action as well, allowing us to tap into and engage our Emotional Intelligence--our imagination, creativity and emotions-- creating a balanced and integrated approach. Neuroplasticity refers to the brain’s ability to change, creating new neural pathways and synapses in light of experience--and this change is generated not only by real-life experience, but by visualization and imagination as well. Research confirms the power of imagination to literally light up our brains in exactly the same way as if we were actually doing. Using self-directed Neuroplasticity techniques, new neural pathways are created when we focus our attention towards a desired outcome--whether that’s learning to play an instrument or succeeding in business--contributing significantly to optimizing the “mind-set” for achieving our goals. The key is developing our Emotional Intelligence. Creativity and visualization are core components of it, but it also means being cognizant of and managing our emotions, as for better or worse, emotions, especially sustained ones, drive us in powerful ways. They also have the power to intuitively guide us, and to change every aspect of our being--from the tiniest cells in our bodies, to the largest neural synaptic pathways of our brains. We develop Emotional Intelligence not only through creativity, imagination and visualization, but also by adopting principles of mindfulness--training our minds to stay focused, present, detached and objective—as well as by listening to that inner voice that speaks to us from our deepest intuitive core. Practicing these techniques we see Neuroplasticity in action, and our brains can actually change in as little as just a few weeks--substantially enough to even be seen on a brain scan. When we set your goals using a whole-brain approach, we harness the full power of Neuroplasticity to activate Emotional Intelligence to achieve our goals. Give it daily attention and see how quickly goals come to life. Want to supercharge your Emotional Intelligence to achieve your goals? You’re DNA is being recoded now, creating new synaptic plasticity to have all of the above. Now go out there and “Just do it”! Marina Rose, offers QDNA® Private Sessions, and creates custom tailored QDNA® Professional and Business Programs and QDNA® Professional and Business Coaching uniquely designed for each particular client’s needs. From group workshops to individual consultation; from team motivation to self-directed practical tools, QDNA® Business Programs are designed to help you and your business work better and succeed. To book a QDNA® Private Session send Marina an email. To learn more about Neuroplasticity and Emotional Intelligence follow the latest news, tips and resources at QDNA® What’s New and learn more about QDNA® Professional and Business Programs held at locations world-wide each year. For more information about the science of Neuroplasticity and scientifically validated self-directed programs that apply breakthroughs in brain research to enhance human performance and brain health, visit BrainHQ, Brain Training That Works. For more information about BraveHeart Visionary Women, a global community that encourages connection, expression and prosperity, visit: www.braveheartwomen.com Be. Create. Collaborate. Marina Rose is the founder and developer of QDNA®, Quantum DNA Acceleration®, a revolutionary new technique for quantum growth in life and business. QDNA® uses the latest cutting edge science in Neuroplasticity and DNA Reprogramming to develop plans of action that activate solutions for you and your business needs. It compounds Quantum Field principles, Positive Psychology, and Epigenetics, in a powerful new technique to assist you to achieve desired results. Accelerate your life and business now. 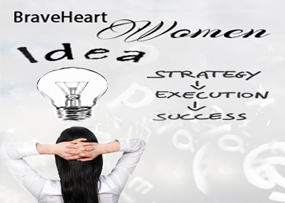 This article was written and appears as part of the BraveHeart Women Visionary Author Series.